The two most common situations where kittens may need to be hand-reared are either because they have been orphaned, or because their mother is not providing adequate care. This second point can be due to a variety of reasons, but the most likely cause is that the runt of the litter may be being overlooked by the mother in favour of healthier kittens. In this instance, simply trying to force the mother to spend more time with the poor-doing kitten is not sufficient, as the mother may either continue to ignore the kitten, or worse, she may actually try to harm it. For this reason, if you have a litter of kittens and you notice that one is not being cared for, it is usually best to remove the kitten from the mother and care for it yourself. Neonate kittens will require continuous monitoring, especially during the first couple of weeks of life. A newborn kitten’s weight will need to be recorded at a minimum of once a day, and twice daily would be preferable. Poor growth is almost always associated with a poor prognosis, so it is critical that the weight be assessed for positive growth. As long as the kitten is growing properly, you should see a doubling of the weight within the first two weeks. Temperature is another parameter that should be evaluated daily, as a hypothermic kitten will have a harder time maintaining a healthy immune system if it is having difficulty maintaining an adequate body temperature. It is worth noting that newborn kittens have a lower body temperature at birth than the normal body temperature they will maintain as adult cats. The newborn kitten can have a normal temperature at birth of 36°C, whereas an adult cat will have a body temperature of approximately 38.6°C. For the monitoring of both of these parameters, it is important to find an accurate reference guide against which you can match the progress of your kitten; your veterinarian should be able to provide you with resources to allow you to do that. Another critical aspect of raising a newborn kitten is to ensure that it is receiving adequate nutrition. These kittens will need to be fed a milk replacer for the first several weeks, and standard milk from the grocery store is not enough. There are many homemade milk replacement recipes available, but caution needs to be taken when preparing these, as it is easy to create a milk replacement that is not properly nutritionally balanced. A better option can be to buy a pre-made milk replacer, either from your veterinarian or from a pet store (a good choice is KMR Kitten Milk Replacer). It is important to carefully read and follow the feeding instructions of the diet, and be prepared to have to feed your kitten frequently. 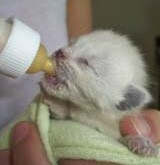 Typical feeding routines for kittens during the first week of life involve feedings every two to three hours. Ideally, the replacer should be fed from a baby bottle, so that the kitten learns how to suckle. If that doesn’t seem to be working, a process called gavaging can be done, which involves having a feeding tube passed down the throat of the kitten. This procedure requires the involvement of a veterinarian, but can often be an excellent alterative to bottle feeding, as it usually takes less time and ensures that the kitten is receiving all of its nutrition. A final point to consider during the care of a newborn kitten is its ability to urinate and defecate on its own. In a healthy litter, the mother will actually lick her kittens’ urogenital area in order to stimulate urination; she will do this for the first couple weeks of life until her kittens learn to urinate on their own. In order to supplement this maternal behaviour, a good technique is to take a warm washcloth or cotton ball and gently wipe the kitten’s urogenital area until elimination occurs. Again, this will need to be done every couple of hours until the kitten is old enough to eliminate on its own. This article is just a brief summary of the care required for newborn kittens. Especially during the first two weeks of life, these kittens need constant monitoring and attention to ensure that they are growing and developing at an acceptable rate for survival. If you do decide to care for a newborn, it is important to gather as much information as possible, and to be in contact with your veterinarian in order to provide the best possible care for your kitten.